Hey y’all! 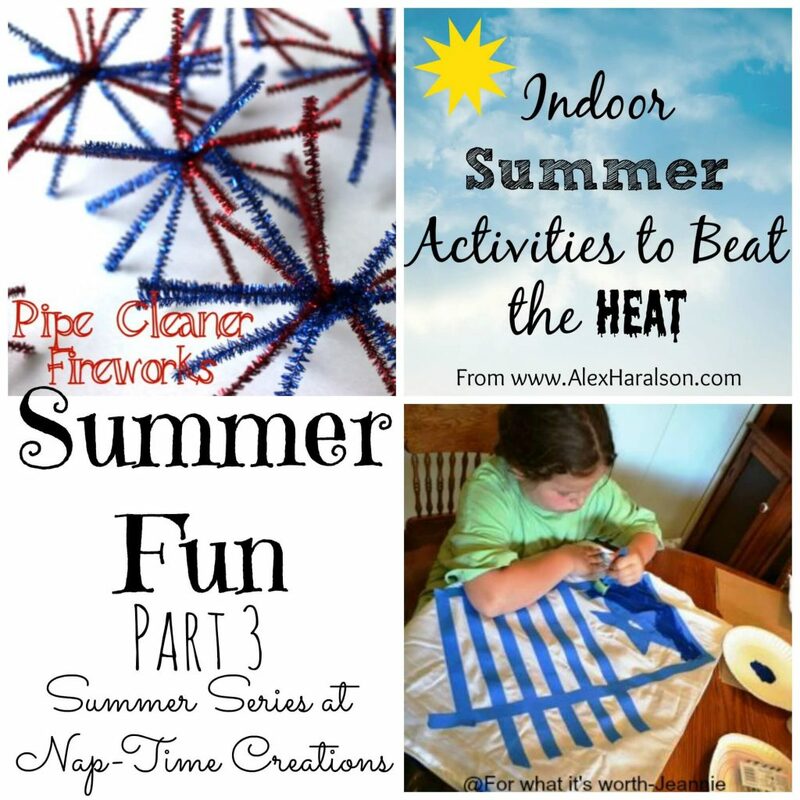 And a special hello to those of you popping over from the Summer Fun Series at Nap Time Creations today! If you’ve never been here before, I’d love it if you’d poke around some! 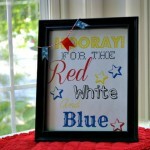 Today, in honor of the 4th of July next week, I thought I’d share with you how I decorate our home for the holiday on the cheap! 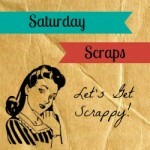 What you need to know first, is that I was raised by a Southern mama, who would never have left a table un-“scaped”. (I’m going to say that’s a word…just trust me.) As a result, I’ve become quite the tablescaper too! There’s just something “homey” about it to me. It helps that it reminds me of my mom. Anywho, thanks to that lovely lady, I have tons (and I do mean tons) of table linens that I inherited from her when she passed. 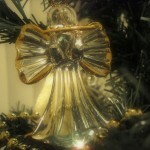 I rely heavily on those when I’m decorating for the holidays but if you don’t have a huge stash like I do, no worries! Let’s take a look at what I did to get our home ready for the big day. 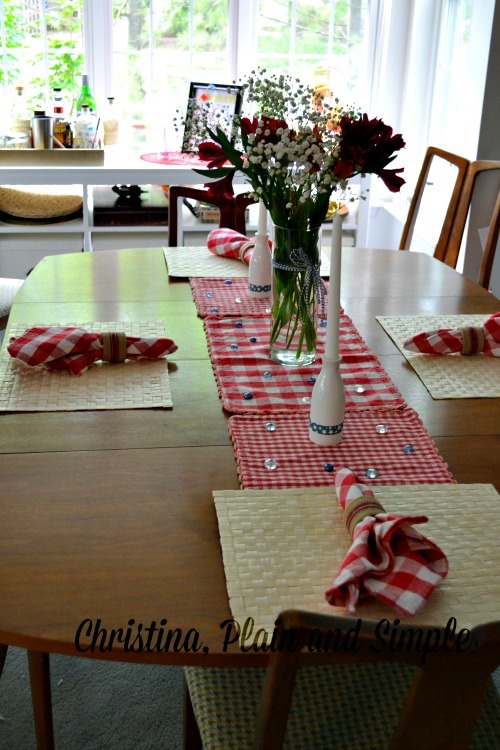 I started by using three gingham and buffalo plaid placemats as a faux table runner. 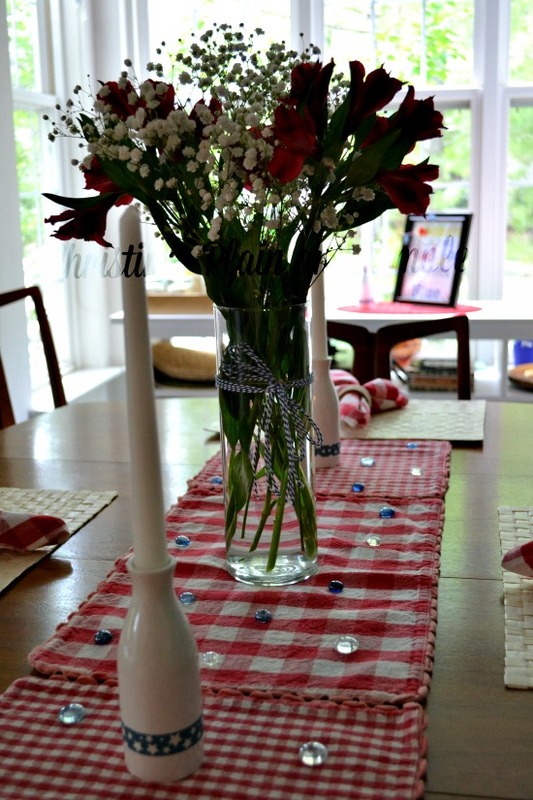 Then I layered on some of my favorite Ikea natural placemats. I used the matching napkins from the “runner” as the napkins to tie it together. Then I grabbed my burlap and red napkin rings. 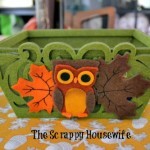 I love the mix of natural fiber and cloth! The candle holders are some small milk bottles from the Target One Spot from awhile back and the blue and clear glass beads are from a friend’s wedding. To spruce up the milk bottles I just added some of my favorite washi tape and I added some blue and white twine to the vase. Super simple. Click on the image to find me on Instagram for more sneak peeks like these! 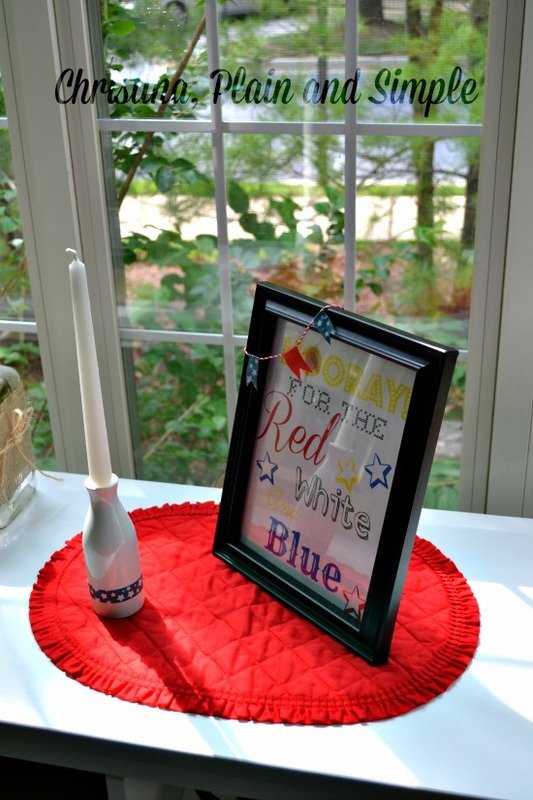 I added another candle to my FREE PRINTABLE for the Fourth of July displayed on our sofa table. 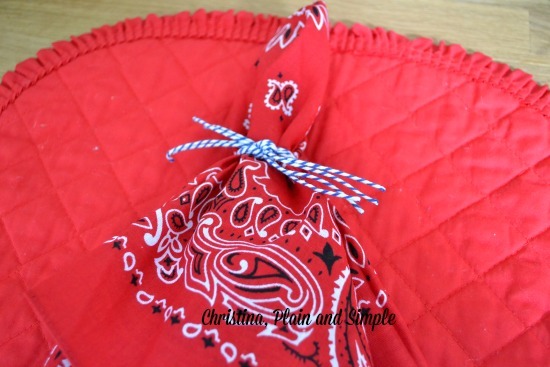 And then I used some bandanas and red placemats to decorate our kitchen island. I didn’t have anymore of the burlap napkin rings so I just used more twine! The only thing I paid for were the fresh flowers and for $12 I got a vase full in our dining area AND our kitchen. Not bad! Easy Fourth of July Mini Garland and FREE Printable! I used to “tablescape” until I had kids. Now the dining room table is for puzzles, homework, blogging and legos by the zillions. I love the way it looks, though. Someday…. 🙂 And I LOVE those milk bottles! 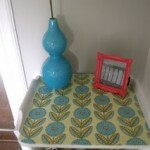 Washi tape is genius! I can’t believe those candle holders are milk bottles! So adorable! 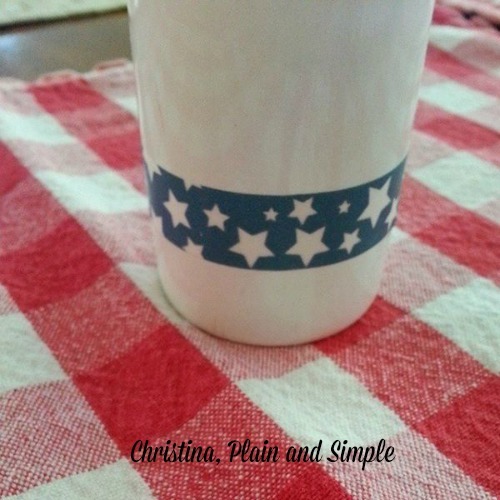 The washi tape is perfect for them (and you can switch the tape around for various holidays). I also really like the fresh flowers with the simple addition of baker’s twine. Thanks Dianna! 🙂 I had the same thought about the washi tape. I’m sure this isn’t the last time you’ll see me do this! It looks really nice and the colour with the natural fibre (that’s how we spell it in Australia) looks pretty. I hope you have a great 4th July. Thanks Megan! Do you have an equivalent holiday in Australia? My table is covered with randomness all the time!! Yours looks great!! oh I love that printable too! thanks for sharing!